A major dispute has erupted between the Fatah and Hamas delegations in recent talks in Cairo on implementing a Palestinian reconciliation agreement recently signed in the Egyptian capital. 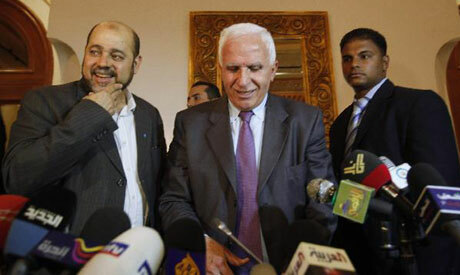 Ahram Online has learned that the dispute revolves mainly around whether to wait for the Palestinian parliament to approve a transitional unity government or not. Sources have confided that Fatah officials are the ones who objected to the suggestion. Fatah wants the new government to take its oath infront of Palestinian President Mahmoud Abbas, as was the case with Salam Fayyad's government. Hamas, on the other hand, views the situation as a further manoeuvre by Fatah to undermine the rights and powers of the Palestinian parliament as stated in Palestinian Basic Law, which necessitates the approval of parliament for any government before it assumes its duties. Hamas officials insisted that intransigence from Fatah would obstuct the full implementation of the national reconciliation agreement signed last month, bringing the situation back to square one. Meanwhile, Fatah is keen to pass over the parliament as Hamas members compose its majority.